My work is based on a perpetual passion for giving life through composition. As a former landscape designer, I have always been fascinated with colors and shapes and how they interact. Printmaking has become my primary means of artistic expression. I like the infinity of all the layers that can be achieved, the richness of the color and the sophistication of the lines that can be rendered through this complex medium. My inspiration comes from found objects and other elements, and deals with personal observations and experiences acquired from visiting and living in different countries. 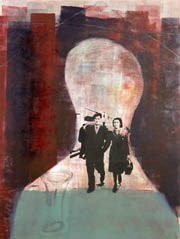 In my prints, I juxtapose materials, images, shapes, and colors through a combination of different techniques. The elements blend, almost threatening each other, creating a prototype that is rich, edgy and commanding all at once. 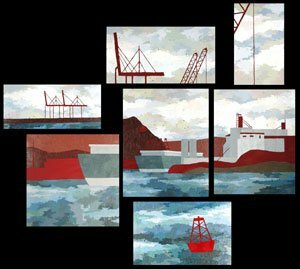 The resulting images portray a characteristic and contemporary style that invites individual responses and interpretation. Regardless of the approach, art makes me feel happy and alive. After receiving a BFA with a major in painting from the Massachusetts College of Art, Lawrence spent the next 10 years of her summer vacations from the John F. Kennedy Presidential Library and Museum in pursuit of graduate studies in different parts of the world. 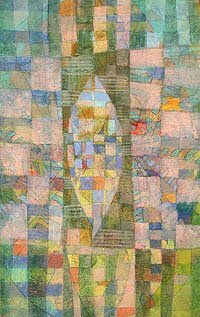 During one summer, Tom Carr, a professor at the Escola d’Arts Plastique I Disseny in Barcelona, Spain (Barcelona Oldest Art Academy) advised Lawrence, “I can see in your paintings that you like quiet and stillness.” Says Lawrence, “His statement continues to give me pause to reflect. As one of eight children from a family whose parents were born in Italy, I remember the many times I retreated to the room I shared with two sisters to draw in solitude. In fact, this past year during open studios, the wife of a fellow studio artist came up to me and commented, ‘Your art is so peaceful. 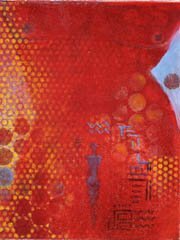 '” Paintings by Josie Lawrence are held in the JFK Presidential Library and Museum as well as in private and corporate collections throughout the US, Europe and Asia. 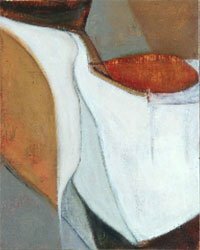 Her work has been shown in exhibitions in the US, China and Italy with awards annually from juried shows. The veil has many meanings and symbols in the Middle East. While often perceived in the West as a symbol of female oppression and submission to male authority, it takes on a very different meaning in the Arab world. 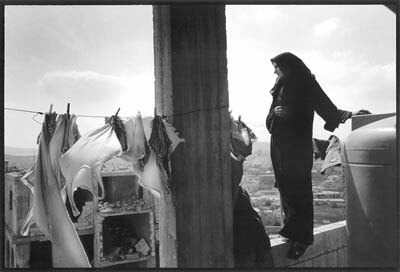 In this photo essay, I will focus on the spread of the veil amongst women in Lebanon and the different interpretations the veil takes on. Lebanon is a small Middle Eastern country wedged between the West and the Muslim world, where Christians and Muslims have lived together for centuries, where one would witness a blend of the West and the Arab world, of Christianity and Islam, in addition to ostentatious display of wealth and extreme poverty. After fifteen years of a brutal civil war that ended with no clear winner and no real solution, life in Lebanon goes on in a surreal way with a mosaic of co-existing religions. The Muslim population is growing larger due to a higher birth rate. It is highly politicized and seething with anger at the news coming from Iraq and Israel/Palestine. In addition, since September 11, it feels threatened in a world looking at any Islamic piety with suspicion, with a resulting retreat into more religious consciousness. While many Muslims, especially the upper class, look westward in their dress and lifestyle, and are not antagonistic to the Christian presence, many feel the need of belonging to the larger Muslim community. The female veil which was almost non-existent a decade ago in Lebanon is making a comeback, even among the younger generation, and is taking on different symbols ranging from religious devotion, to self-assertion vis-à-vis the West, to a new item of fashion, all leading to the increased social pressure of wearing it among Muslim women of all ages. While wearing the veil among Muslim women is becoming more common in Lebanon, the different ways of wearing it is often misunderstood by the West. Women who are wearing the veil are mostly doing it by choice, even though their motives and the extent to which they are covered vary. 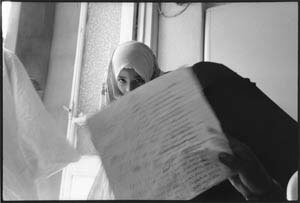 Older traditional Muslim women wear the headscarf because of religious devotion and modesty. They only take it off inside the home and only in the presence of other women or close male relatives. Upper class Muslim women who often dress in a western style now wear the headscarf as an instrument of fashion and an added accessory, whereby the scarf has to match the clothes, the sunglasses and the handbag. Some women wear it as a political statement of resistance to the West and a symbol of solidarity with Muslim countries at odds with the West. Pubescent girls are now succumbing to social expectations and are wearing the veil by choice as a symbol of growing up. 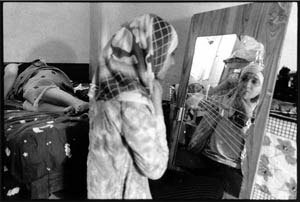 Some would spend hours fixing their headscarf in front of the mirror. They wear it layered, braided or plain but always color coordinated with their clothes. More info about Rania Matar can be found at www.raniamatar.com. Abstractions of a mental state. The logic of factory-grey & desolation — a girl & her printing press, isolation. The mechanized clicking of thinking — these are objects & landscapes that exist, but no one has seen them. My logic — logic in general — crumbles & twists, formulates itself in black etching ink. 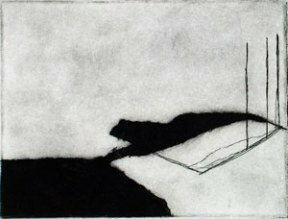 My etchings are the outcome of my perception of existence — bleak & strange. More information on this artist can be found at www.laraloutrel.com. Cargo. Weighty, anonymous, masses of consumable goods. A voluminous presence that fails to fill the absence in which it is placed. Shipping lanes. Highways. 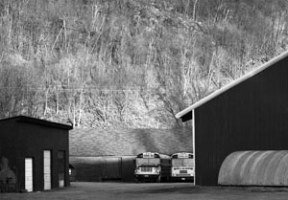 Storage yards. Gateways through which material goods in their anonymous phase leave or enter our lives; portals through space and time for Things. Solidity. Gravity. “Needs”. I see in these portals stillborn opportunities. I see what was here, before the cargo and the promises. I see a mirage of material goods preening with seductive poise. I see what cargo cannot replace. I see the potential for change. These sites speak to me of how anonymous consumption fragments our society within itself and divides us from the environment. Stained wood reveals an absence of nature that this ingestion of goods creates. To me it is an absence that screams. Yet these goods pass as unbranded cargo through quiet ports, sleepy highways, and placid storage fields. These places stand as silent memorials to what we have sacrificed in order to achieve the cargo we so fanatically pursue. For me these are peaceful places. Like cemeteries, or morgues. Tranquil, beautiful, and tragic. More information on this artist can be found at www.dawnrevett.com. The work that I am showing here is the product of the 40 year period 1966-2006. 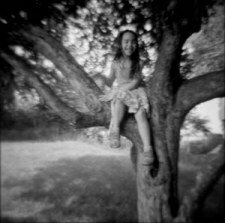 I have always been a photographer in black and white, and I have primarily used a view camera with which I expose 4 by 5 inch sheet film. I have printed the more recent images digitally, after scanning the negatives into my computer, while photographs that precede 2004 I have printed in my darkroom. Hayes is an artist of international reputation whose work is held in collections around the world. Painted Prayers are large-scale abstracts. “I paint in abstraction because there is not a specific face or people which reflects the world’s condition. 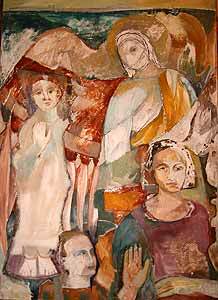 These paintings offer prayers for preserving human dignity and rights in the face of historical hatreds. I see hope, love and beauty in the human spirit. It would please me greatly if a little of this shines out from my paintings.” More images of Hayes work can be found at www.priscillahayes.com. 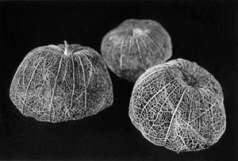 Meg Birnbaum has won a wide range of awards for her photographs. Works have been shown at The Somerville Museum, Willoughby & Baltic Gallery, The Newton Free Library, Holyoke Center at Harvard University and included in the fall 2005 issue of The Harvard Review. 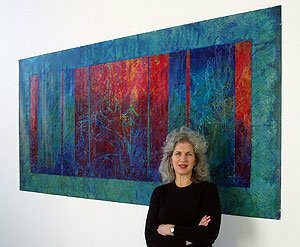 Birnbaum was the first place winner of a national juried all-media show at Fitton Center for Creative Arts, Hamilton OH. All of the photographs appearing in the Belmont Gallery show were hand printed using a traditional wet darkroom. Images of Birnbaum’s work can be found here. 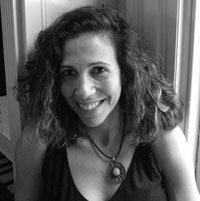 Fran studied art and sociology as an undergraduate at Brandeis University and then received an MSW, working for several years with heroin addicts. Discovering that she could indeed earn a living in the arts, she entered Boston University’s School of Fine Arts where, specializing in photography and graphic design, she received her MFA. She has held a succession of positions in the field of design: branding, print, and signage for corporate, arts, and retail establishments; CD-roms for books, museum installations, sales and training; book cover illustrations; animations, multimedia, and web designs. Most recently, Fran was Senior Designer with AOL Time Warner, where she was designer of the pre-eminent web site devoted to African American culture. 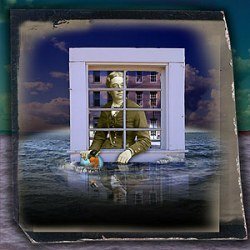 Between professional life and raising two daughters, Forman continued to create her personal art, combining her illustrative and photographic skills with a passion for surrealism, paradox, illusion, assemblage, and the dislocations of time and place. 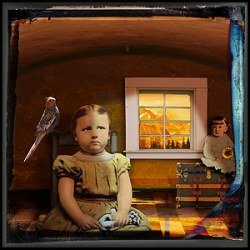 With a background in psychology, design, and photography, I am influenced by the photographic potential of fabricated worlds and the surreal intersection of portraiture, dreams, and memory. My collaged images often begin with the humble tintype portraits of anonymous mid-19th c. Americans. Dressed in theirfinest, posed in the itinerant photographer’s makeshift studio, they sat immobilized,then waited to receive copies of their new ‘instant’ likeness. They paid a penny or less and presented their tiny metal images to loved ones, perhaps to mark a special event in their lives, or before they headed off to battle.Their desire was to be remembered. I photograph and re-assemble these images into a fabricated environment;I incorporate objects as clues in an attempt to suggest a buried narrativ eand a connection to their past and future. Through them and the worlds in which I place them, I try to make sense of issues of time, relationships,and connections. My inspiration derives not only from 19th c. photography but chiefly from the 20th c. artists using visual narratives and symbolism to convey ideasand interpretation of the human condition: the juxtaposed assemblages of Joseph Cornell and Max Ernst, the paintings of Rene Magritte, the poetry and photography of Duane Michals, and the ordinary but surreal imagery of Ralph Eugene Meatyard. The sun is the primary architect of my images: plants will not bloom without sun, and in my photographs the sun reveals the forms of the flowers. Their geometric curves and planes are defined as their surfaces bear witness to the strength of the summer sun. Presenting these flowers in natural light is a testament to their origins. So are china and glass formed by high heat, and only light coming from the extreme temperature of the sun can reveal their true colors and the reflection and sparkle that make them gorgeous to see. 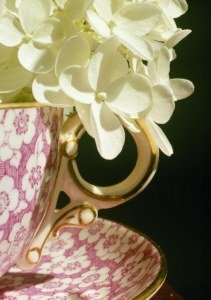 These fragile artifacts – both the flowers and the antique vases – gain a reprieve from decay, being captured on film together, in their combined opulence. If flowers were not ephemeral, there would be no point to my pictures, which are a means to express admiration for their ineffable beauty, postponing inevitable loss. Ellen Solari is a member of the River Street Artists in Waltham and is an art teacher at the Our Lady Comforter of the Afflicted School in Waltham. Her work has been displayed throughout New England for more than a decade. Nancy Wagner has been the recipient of multiple Mass Arts Lottery grants. 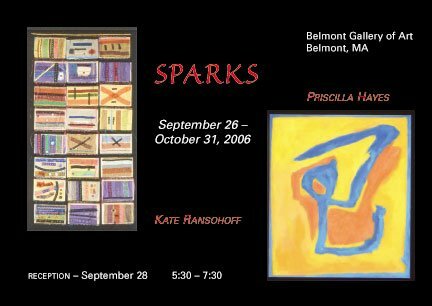 Since 1989 her work has been shown throughout the United States and in the selected collections of corporate entities including Fidelity Corporation, The Boston Company and Morgan Guaranty Trust. As an artist my work has ranged from realism to abstraction, from figurative marble carving to multi-media installation, from etching to animation. My focus is typically intense and in depth. I dive into a particular realm or a particular project for a period of time before emerging with a fresh body of work and a new outlook on the world. While my classical training may be discerned, my propensity to explore new territory is clearly evident. Often my work results from a cross-disciplinary approach to materials and processes and often it reflects my delight in investigation and innovation. For many years, I have focused on the role of memory in the structuring of perception. Much of my work has involved the layering of images, language, and forms; the juxtaposition of organic to inorganic; and the use of multiple elements to create a cohesive whole. Drawing from personal experience, elements of the various environments in which I lived filter into my work; from the streets of Boston to mountain villages in Italy; from Western landscapes to Eastern seashores. While I have employed a wide range of media, for the past decade wire and fiberglass mesh have become my preferred materials. I see screen as a metaphor for the filter of memory; the mesh through which we filtrate experience and the lens through which we view the world. Drawn to this non-traditional material by the nature of its structure as well as by its beauty, flexibility, and strength, I have worked with it extensively. I began by constructing sculptural forms with woven metal, combining different metals as well as painted screen and in many cases using these forms as key components in multi-media installations. I first focused on painted screen as an end in and of itself seven years ago. Since that time I have developed numerous techniques which I employ in layered combinations to create painted images on screen. I call these images “Rete-Chromes”. Rete-chrome is my word for both the particular series of connected processes and the resulting artwork that have been my focus for the past seven years. Pronounced rêt-ê-krôm, it is derived from rete, Latin for net; and chrome, Greek for color. 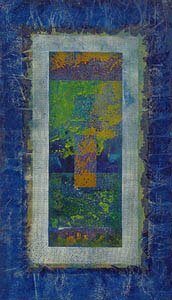 My method involves applying layers of pigment, both directly (as in painting) and indirectly (as in printmaking) to attain images on an open-weave backing. Qualities of transparency, translucency and opacity are important aspects of the “Rete-Chromes”. Due to the open weave of the screen, light flows through the image where there is less paint and is blocked to varying degrees where the paint is thicker. This in turn produces complex cast shadows and allows for a rich interplay between image and environment. 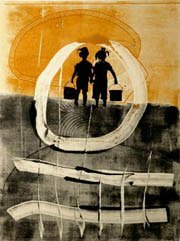 Since emigrating from Russia in 1989, Arlington artist Olga Yulikova has been active in the arts as a teacher as well as public and commissioned artist. 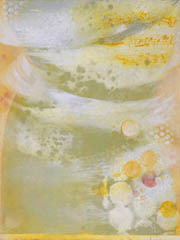 Olga has taught at the Arlington Center for the Arts, Brookline Art Center, Braintree Art Center and the JCC, Brighton. Her public murals and installations have been commissioned by the cities of Cambridge, Boston and Brookline as well as in California. Layers of memory, layers of meaning, layers of paint, these are the key ingredients in my paintings. They are inspired by my travels, my friends, books I read, stories I hear. They reflect my hope and longing. They are made up of all my personal history, my infatuations, secrets and hang-ups. The paint is just a safe medium I use in order to share my secrets. Some pieces are more coded (and coated) and layered than others. All Angels Against War for example was my reaction to the beginning of the war in Iraq. I was very much against it, and was just returning from Italy where the peace Pace flags were waving everywhere in the protest against the American invasion. On that trip I visited a church in Verona with the most exquisite recently restored frescos that were once ruined during an ancient war. The crumbling images of saints and warriors were so beautiful and sad, and the entire walls were chiseled with what looked like bullet holes. Explained the helpful attendant of the museum, these were the marks made by some older weapons. These holes, these symmetrical marks were more detrimental than the time that ages frescos. I thought I had to use this effect in my antiwar paintings somehow. 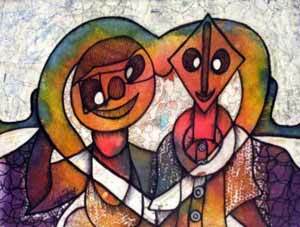 The Belmont Gallery of Art will host an exhibit of works entitled Expression by Yoruba artist Olusegun (Segun) Olorunfemi from October 11 until November 18. An evening opening is scheduled for Friday, October 14th, from 5 until 8pm. The public is cordially invited to attend. The title piece is a sand painting that will be exhibited as a work in progress, introducing us to the Yoruba greeting Eka that is EKABO or E KU E WU ABO. Asked to translate, Olorunfemi smiles because the greeting has no direct English translation and requires explanation. It expresses a host’s honoured delight upon arrival of a visitor whose travels might have exposed them to any number of possible risks and dangers. Also illustrated are the many ways people express themselves. 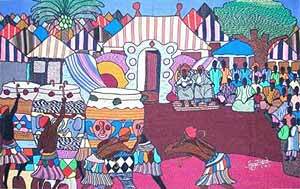 As a professional artist Olorunfemi is listed in Who Is Who of Nigerian Art. Aside from having served as the artistic coordinator of the Toki Arts Centre in Ibadan, Nigeria, he is also recognized in his homeland as a dancer, musician and storyteller. Commissioned mosaics for public spaces can be found in the Hilton Hotel in Lagos, Nigeria; the Mariposa Museum of World Cultures in Peterborough, New Hampshire, to list just a few. His participation in international exhibitions has taken his work as far as Europe. Olorunfemi as educator has brought his gentle arts to thousands of children in public and alternative schools in the US. These residencies are organized by Very Special Arts New Hampshire. This institutional link between the US and Nigeria exists for the purpose of providing arts enrichment to schools throughout the state. Appointed Executive Director of Very Special Arts Nigeria in 2002, Olorunfemi has conducted workshops in Nigeria and the US since 1998. Most recently with the New Hampshire Institute of Art and NH State Council on the Arts, 2005 Arts in Education Conference: The Creative Journey. In Yoruba culture artistic discipline can begin very early with observation and encouragement of acute attention to principles as practiced by accomplished artists. Extended exposure to these principles creates a depth of learning that then extends into other areas. Fast becoming known throughout New England as an ambassador at large for a voice celebrating the simple elegance of traditional wisdom, Olorunfemi images inspire recognition of the roots of human dignity. Traditional Yoruba culture as expressed by Segun Olorunfemi presents a vision of life speaking to the universal nature of our hearts and minds. Expression is an apt title considering the wide variety of media, styles and subjects. 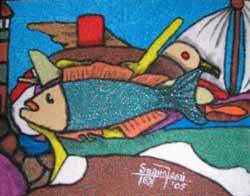 The works exhibited include batik on rice paper, hand coloured linoleum prints, paintings in oil on paper as well as sand paintings and yarn paintings. Gallery visitors may preview some earlier work by Olusegun Olorunfemi on his website, www.segunfemi.com.